MANILA, Philippines - Team Lea's Esang de Torres impressed the judges on her performances during the grand finals of 'The Voice Kids' Philippines Season 2 on Saturday, August 29, 2015 at the Newport Performing Arts, Theater, Resorts World Manila, Newport City in Pasay City. The 8-year old young artist from Tondo, Manila performed a duet song with It's Showtime co-host and singer Billy Crawford. "Yung fun and light side niya nakita ko” Coach Sarah said to Esang’s performance. Aside from Esang, other artists fighting for the grand title are her teammate Reynan Dal-Anay and Team Bamboo’s Sassa Dagdag and Elha Nympha. The winner of 'The Voice Kids' will be named based from the outcome of the public's votes. 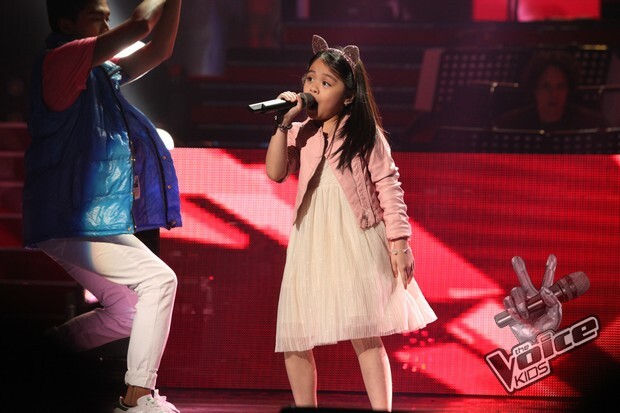 Is Esang de Torres the next “The Voice Kids” grand champion? The title holder will win a recording contract from MCA Music Inc., a music instrument package, a family utility vehicle, a house and lot worth P2 million, P1 million cash, and a P1 million trust fund. #TVK2Finale: And 'The Voice Kids' Season 2 Grand Champion is.. The finale episode on Saturday tops online conversations with '#TVK2Finale' among the trending topics. Don't miss the results night of 'The Voice Kids' Season 2 on Sunday, August 30, 7PM on ABS-CBN.